Welcome to the third installment of Weekend Retro Rewind. 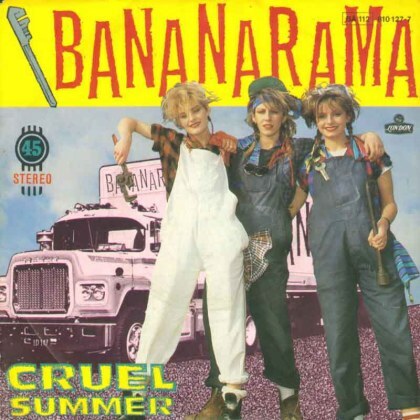 Anyway, the song is by Bananarama and it's "Cruel Summer" -- anyone remember it? I was really bummed when I bought the Karate Kid soundtrack tape (yes tape, it was 1984!) and this song was mysteriously missing from the soundtrack album. Not cool Bananarama, not cool. *note the dialog is in Spanish because the US version had the audio removed due to copyright issues. Cruel Summer is an excellent song! I always think of The Karate Kid when I hear it. Good stuff! Have you seen the trailer for the remake? Piece of crap. Lol. Ali with an 'i' makes Alison with one one 'l' and an 'i' smile. Cruel summer is good, but I was more into Venus. I liked their costumes in the video more. I loved Bananarama but don't know this song very well. It obviously wasn't on my Bananarama WOW cassette which is all I had. I remember the Karate Kid craze but always had to sit a little bit on the sidelines with it because I *gasp* hadn't seen it yet (I blame it on having a betamax in a small town that only dealt in VHS). When I finally caught it on TV I was thrilled that the main characters were called Alison and Daniel - I too, am an Ali with an i (though I thought -lly was far more cool) and my crush at the time was an unwitting boy called Daniel. I remember the song, but not the video. I was born in 84 too! I sort of remember that song, I do like it, it's catchy. Did you realize that the Karate Kid clip you put up is the spanish version? The video's really simple. Not like the ones that come nowadays! Aah, Karate Kid! I remember going to a White Sox game when I was younger. My dad got skybox tickets and Mr. Meogi (no clue on spelling) threw out the first pitch, then he came up to the sky box level and my brother asked him for his autograph. Gurl you had me at Bananarama I am definitely following your blog! How could I NOT comment on a Karate Kid post?! Only the greatest movie in the 80's! Ah Elizabeth Shue, where have you gone? I hate when they do remakes of movies!!! I love Elizabeth Shue! Especially in Adventures in Babysitting! I know this song. We have a bar downtown that does an 80's night. They always play Bananarama. I wonder if they still play. I SO love that song. Used to sit on the roof of my garage and tan while watching the cruisers on the main drag. How I love the summer and how this song takes me back. One of my most favorite movies ever! You may not have the Bananarama song, but 'You're the Best' is on there, right? I love that song! It's my favorite treadmill song.... You're the best! Around! Nothing's ever gonna keep you down! I have to be honest. I used to have the biggest crush on Elizabeth Shue. In fact, I'd still be willing to date her. I still find myself listening to 'You're the Best' by Joe Esposito.